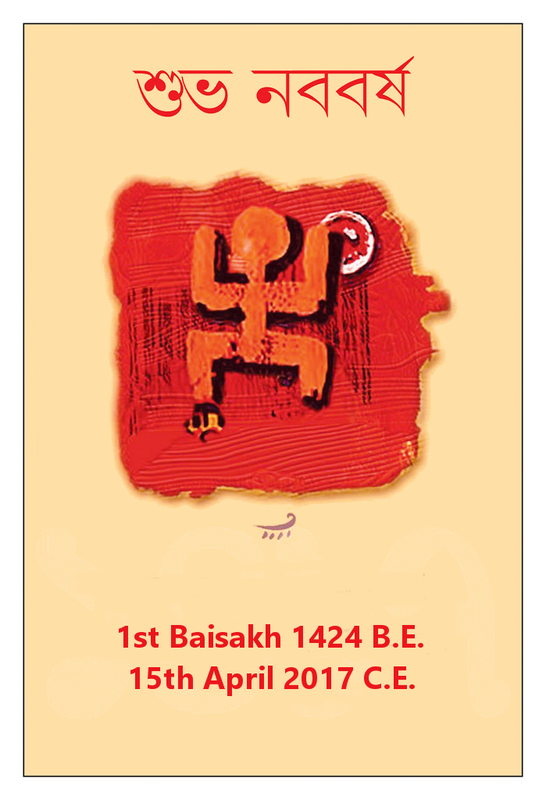 On Saturday, 15th April 2017 Common Era, Bengalis in India, especially in West Bengal, Assam and Tripura, will celebrate the 1st Baisakh, or “Poila Boisakh”, 1424 Bengal Era (BE) -- the start of the Bengali New Year. Most of us are aware that the globally used Common Era, or Christian Era, starts with the birth of Jesus Christ in 1 CE, but what exactly is commemorated by the start of the Bengal Era? What happened in 1 BE? There are two points of view. Raja Shashanka is the first universally accepted ruler of a major part of the land mass that is associated with Bengal -- West Bengal & East Bengal / Bangladesh -- today. His capital was at Gaud (current Murshidabad) and he was a contemporary of Raja Harshavardhana of Kannauj (near Lucknow) in the West and of Raja Bhaskar Varman of Kamarupa (Assam) in the East. These three persons were the three principal rulers of North India. While exact dates are not available, it is strongly believed that Raja Shashanka ruled in Bengal between 590 CE and 625 CE. If we can assume that Raja Shashanka ascended the throne on 594 CE and Bengal celebrates the same as the start of the Bengali Era, then in 2017 CE, the Bengali Era year should be 1 + (2017 - 594) = 1424 BE which is exactly what it is on 2017 “Poila Baisakh”. Hence the Bengal Era begins with the ascendance of Raja Shashanka to the throne of Gauda-Bengal. Long after Raja Shashanka and the Hindu rulers of Bengal were dead and gone, Bengal came under Islamic rule when Bakhtiar Khilji evicted Lakshman Sen in 1206 CE. Subsequently Bengal became a province under the Mughal (Mongol) empire that followed the Islamic Hijri calendar. But the Hijri calendar was an administrative nightmare in an agricultural economy and Akbar was the first to understand this. Agricultural revenue is tied to the harvest and it is most easily collected at the end of the harvest season when the farmer has money in his purse. Seasons in turn are tied to the position of the sun as defined by solar months that commence with the entry of the sun into the signs of the zodiac. So there is a one-to-one fixed connection between a solar month, the position of the sun and the seasons. For example, the spring or vernal equinox happens on 21 March of the Gregorian Calendar or on 1st Chaitra of the Saka Calendar, the official Government of India calendar, because both of these are solar calendars. The Islamic Hijri calendar is based on lunar months where the start of each year varies widely across seasons -- in some years, the year starts in summer, in other years during the monsoon or in winter. So tax collection based on the Islamic year was a nightmare because the tax collector might arrive when the seeds had just been sown and the farmer would not have the money to pay his taxes. This would lead to endless arguments. Akbar realised that the Hindu calendars, that were based on the solar months, were more useful for tax-collection purposes, because the year started on a fixed seasonal date. So he adopted the solar calendar, according to which the year of his coronation in 1556 CE was 1 + (1556 - 594) = 963 BE according to the Bengali Era. Coincidentally -- and this was a huge coincidence -- 1556 CE was also 963 in the Islamic Calendar. So in order to not lose face by having to replace the unstable Islamic lunar calendar with the stable Hindu solar calendar, he adopted the Bengali solar calendar in 1556 CE, the year of his coronation but instead of defining it as Bengal Era year 1 BE, he declared it Bengal Year 963 BE, so as to maintain the illusion that he was continuing with the Islamic calendar. But going forward, the administrative year was aligned to the traditional Bengali solar year so that seasons will begin on fixed dates. So, the first, simple, explanation for the Bengali Era is that it starts with the ascendancy of Raja Shashanka to the throne of Gaud in 594 CE with the first year being defined as 1 BE. The alternate explanation is that it starts with the coronation of Akbar in Delhi in 1556 CE but with the first year being numbered 963 BE to maintain an artificial equivalence with 963 Islamic Era year that was prevailing at that time. Now it is up to the reader to decide whether he or she wants to start Bengali Era with the coronation of Raja Shashanka at Gaud, in 594 CE or Akbar at Delhi in 1556 CE. Actually Akbar would have got away with this sleight of hand of passing off the Bengali Era as being an extension of the Islamic Era but for the start date. Akbar had his coronation on 14th Feb 1556 CE and if the Bengali Era was based on this event then the first day would have been 14th Feb. But all Bengalis celebrate the new year, 1st Baisakh, currently 14th April, when the Sun enters the constellation of Aries or Mesha. This clearly shows that the Bengali Era is actually rooted in the Hindu tradition of Solar years dating back to Raja Shashanka and antiquity. But how do we know which point in the sky is the start of Aries? Where does the zodiac start? 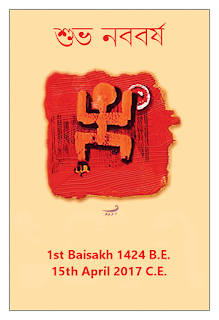 In Bengal, we have 1st Baisakh usually coinciding with 15th April, when the Sun enters the constellation of Mesha (Aries). The Government of India approved Indian National Calendar that is based on the Saka Era defines the start of the year as 21st March which is 1st Chaitra, when the Sun enters the constellation of Meen (Pisces). Now this leads to a strange inconsistency. If the Sun enters Mesha (Aries) on 15 April as per the Bengali calendar, then it must enter Meena (Pisces) on 15/16th March, but as per the Saka calendar, it enters Meena (Pisces) on 21st March. Why this gap? Consider a spherical coordinate system, that is embedded on the Earth and rotates along with it every day. In this spherical coordinate system, every heavenly body, is defined by three numbers -- the azimuthal angle, that shows the position along the equatorial circle or on a longitude, the declination angle, that shows the position above or below the equatorial plane, and a distance from the centre of the Earth. In our assumption, all heavenly bodies are at the same uniform distance and fixed on “the sphere of heavens” and so the distance from the centre is immaterial. The only real variables are the azimuthal and the declination angles and they specify position of every heavenly body. There are two classes of heavenly bodies -- the “fixed” stars and the “wanderers” or “planets”. The “fixed” stars do not change their position in our spherical coordinate system, but the “planets”, that also include the Sun, the Moon, move around among the “fixed” stars as their azimuth and declination angles change with the passage of time. For the purpose of the solar calendar, we will only consider the movement of the Sun as it travels around the Earth. Do note that there is nothing mathematically wrong in considering the Sun to be travelling round the Earth, as frames of reference can be changed without affecting the description of the physical reality. As the Sun moves round the Earth, its azimuth angle, or longitude, changes from 0 through 359 then back to 0 in one year and in the same time its declination angle changes from -23 to +23 as seasons change from winter through spring, summer, autumn and back to winter. The declination being 0 at the two equinoxes, when day and night is of equal length. So the Sun moves in a band around the Earth and this band is divided into twelve sectors of 30 degrees each. Each of these twelve sectors are occupied by, or related to, one of the 12 constellations consisting of the “fixed” stars arranged in certain imaginary patterns -- Aries, Taurus, Gemini and so on. A circle has neither a beginning nor an end and so while the Sun takes a year to complete this circle, there is no unambiguous way to define where exactly the circle -- and hence, by extension, the year -- starts. However, this starting point can be defined in two ways leading to the existence of two zodiacs - the tropical and the sidereal. In the tropical zodiac, the point on the circle when the Sun is at the vernal equinox, and its declination is 0, is defined as the starting point of the year and the azimuth angle is defined as 0. This means that the tropical year starts at the vernal equinox and this is traditionally associated with the entry of the Sun into the sign of tropical Aries -- that is Aries as shown in the tropical zodiac. So now we have two circles, or two zodiacs, with two starting points and these two starting points are approximately 23 degrees separated from each other! This gap is known as ayanamsa and it keeps changing, increasing, with each passing year. At some point in the past, in 285 AD, the position of the Sun at the vernal equinox was directly opposite the “fixed” star Spica. This means the the entry point of the tropical Aries was coincident on the entry point of the sidereal Mesha. In that year, the tropical and sidereal zodiacs were identical. But since the tropical year was shorter than the sidereal year, the next tropical year started 20 min 24 sec earlier than the next sidereal year. With each passing year, the tropical year commenced and additional 20 min 24 sec earlier until the cumulative gap between the respective starts of the tropical year and the sidereal year stands at almost 24 days in 2017 today. But since all official solar calendars, including the Gregorian calendar used in the West and the Saka calendar officially used by the Government of India, are tied to the tropical calendar, the vernal equinox is fixed compulsorily on 21st March / 1st (tropical) Chaitra, when the Sun enter the tropical Aries. But the Bengali calendar, that starts on 1st (sidereal) Baisakh, when the Sun enters the sidereal Mesha begins on 15th April of the Gregorian calendar or 24 days later. The existence of two zodiacs, the tropical and the sidereal is the reason for the gap of 5 days that was the starting point for this discussion. In 285 AD, when the tropical and sidereal zodiacs were coincident, the vernal equinox, the entry of Sun into tropical Aries and its entry into sidereal Mesha -- all three events -- would all have happened on 21st March which would also have coincided with 1st (sidereal) Baisakh. If we keep the date of the vernal equinox compulsorily fixed at 21st March, then with the passage of time, the start of the sidereal year will occur at a later date every year. Conversely, if the start of the sidereal year is considered to be fixed by the arrival of the Sun opposite Spica, and its entry into sidereal Mesha, then the vernal equinox will be 20 mins 24 secs “earlier” each year, when the Sun has not yet reached sidereal Mesha, but is still in sidereal Meena. From this sidereal perspective, the vernal equinox that signals the start of the tropical year with the entry of the Sun into tropical Aries, has now pushed “back” from sidereal Mesha and into sidereal Meena ( or Pisces). Hence, as per western astrological practices, this is the Age of Pisces and after some more time we will move even further backward into the Age of Aquarius. In Hindu astrology, the analysis of the horoscope is based on the positions of the planets in the sidereal zodiac. However all astronomical calculations that are used to generate the ephemeris, the azimuthal or longitudinal positions of planets, are based on the tropical zodiac. Since the sidereal zodiac is about 23 degrees ahead of the tropical zodiac at the moment, all planetary longitudes need to be reduced by this amount -- known as the Ayanamsa amount -- before being shown on the horoscope. Western astrologers on the other hand work with the tropical and do not need this correction. Finally, the identification of 285 AD as the year when the vernal equinox coincided with Spica and the tropical and sidereal zodiacs were identical has been challenged. While this date and the ayanamsa of 23 degrees has been defined by N C Lahiri, other astrologers claim that according to Surya Siddhanta,, the definitive classical text on astronomy, the year of coincidence should be 499 AD and the ayanamsa should be reduced accordingly. This is a big debate with no clear resolution in sight. Happy Makar Sankranti - Today is 15th Jan 2019 and 30th Pous, 1425 in the Bengali Calendar. It is the last day of the Pous month and in the evening the Sun will enter sidereal Makar rashi (Capricorn). Sankranti is the last day of the month and so we celebrate Makar Sankranti in Bengal today. Many other Indic communities all over India who live by the Sanatana Dharma will also celebrate Pongal, Bihu and Lohri. In the tropical year, the seasons are tied to the equinoxes and solstices, as determined by the declination of the Sun over the horizon. In the sidereal year, the months are determined by the azimuthal movement of the Sun into the constellations of the Zodiac. All our normal calendars, Gregorian or Hindu, are based on the tropical year. The tropical and sidereal system were in coincidence in 285AD but have been diverging ever since because the tropical year is shorter than the sidereal year by about 20 mins. Hence the start of the Bengali sidereal year ( and other Hindu calendars) that is defined by the movement of Sun into sidereal Mesha rashi (Aries) has moved from the Spring Equinox (March 21) to Poila Baisakh or 1st Boisakh on 15 April. A gap of about 21 days. Hence Makar Sankranti is actually a celebration of the Winter Solstice when the days start becoming longer again. It is of course tied to the harvest as well. Brilliant and comprehensive analysis. I have forever been intrigued by the differences and read cursorily on the topic, and never really understood. The sidereal year (on which the Bengali Hindu calendar is based) is longer than the tropical year (on which the Christian calendar is based) by about 20 mins. This means that even if the two years began at the same instant, the Bengali-Hindu year will end 20 mins later than the Christian year. This is Poila Baisakh ( Bengali New Year) is drifting past, or falling behind, the Christian calendar. In the past, the Bengali New Year would fall on 14th April but now it generally falls on 15th April. Similarly, Rabindranath Tagore who was born on 25th Baisakh which happened to be 6th May 1861.In 2018, his birthday would still be celebrated on 25th Baisakh but it would be 9th May.